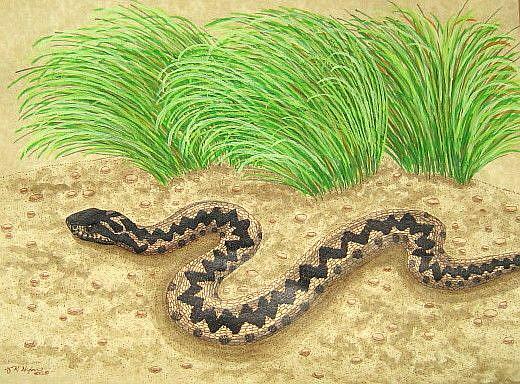 This is a drawing of a European adder, inspired by an interview I read about author Lisa Glass and her novel "Snake Beach". In the interview, she told of a summer where a large number of adders were found on English beaches and I thought it would make a great picture, as we don't usually think of snakes at the seaside. The drawing is done on yellowish calligraphy paper and uses 3 color inks, plus acrylic for the dune grass. I added a bit more shading after I took the photo, so it looks a little better in reality. This picture was part of the 2012 Cold-Blooded Creations Art Show in Florida.